Captain Keith Edinger is a Florida native and second generation full time Southwest Florida inshore fishing guide. He spent much of his childhood learning the local waters. 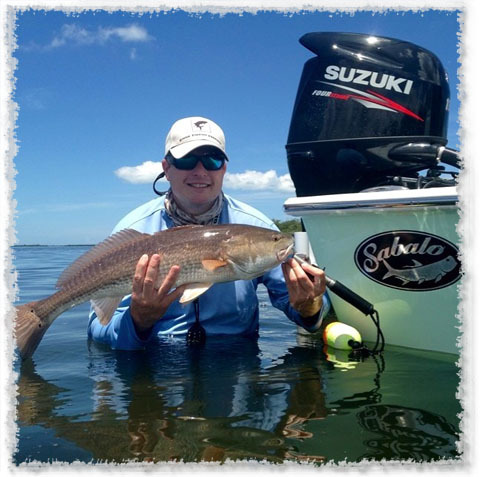 At age 18, Captain Keith developed his passion for light tackle inshore fishing after purchasing his first flats boat. At 26, Captain Keith earned his United States Coast Guard’s Captain License in order to take his passion to the next level. Captain Keith is on the water daily, often running two fishing charters each day. This allows him to know where the fish are biting year round. Since Captain Keith is a full time guide, he does not have the distractions of another job and can focus all of his energy on ensuring you have an all around great experience while catching fish. Captain Keith is the owner and operator of Blue Line Fishing Charters. When you call you will speak directly to Captain Keith and when you book, you will be fishing with Captain Keith. Blue Line Fishing Charters is not a booking service that will just sign you up with any available guide. We have heard horror stories of grumpy guides. Captain Keith is laid back, easy-going and looks forward to giving you the experience of a lifetime. Captain Keith takes great pride in making sure that the boat, and equipment are top notch to ensure every opportunity counts. Captain Keith understands that his reputation is on the line with every fishing charter. Captain Keith specifically tailors every fishing charter to each client. He is excellent with families and loves to introduce children to fishing. Captain Keith has a young son of his own and loves keeping children engaged and having fun throughout the trip. Captain Keith specializes in using live bait and light tackle to target snook, redfish, trout, snapper and tarpon in the waters of Southwest Florida. Capt. Keith is also proud to be named a Sabalo Boats Pro Guide.